With December comes the flurry of shopping for gifts, and the perennial question, what to give? And especially, what do you give the nature-lover or would-be nature-lover? Books are often a good answer. Plenty of information is at our fingertips on the Internet, but there’s something comforting and permanent about a book – a favorite reference. 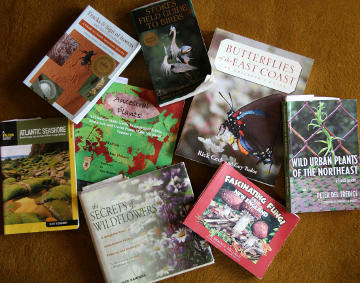 Here’s a short list of eight books on nature topics of interest to New Englanders. These books are readable and filled with pictures – photos or illustrations – and helpful information. They aren’t stuffy, technical field guides. Butterflies of the East Coast: An Observer’s Guide by Rick Cech and Guy Tudor (Princeton University Press, 2005) (paperback) – a lovely coffee-table sized book with photos and definitive, up-to-date information about east coast butterflies, including range maps and photos of the host plants that nourish their caterpillars. Fascinating Fungi of New England by Lawrence Millman (Kollath+Stensaas Publishing, 2011) (paperback) – the first-ever guide devoted exclusively to New England fungi. It’s small enough to carry on a walk in the woods and features the mushrooms and other fungi that you’re most likely to see here in New England. Mushrooms are grouped in a way that makes it easy to match what you see in the natural world with what’s in the book: Do they have gills or not? And do they grow on the ground, on wood, or on something else? A readable, conversational style makes the book fun for young and old alike. A Naturalist’s Guide to the Atlantic Seashore by Scott Shumway (Globe Pequot Press, 2008) (paperback) – We’re fortunate to be within reach of ocean beaches north and south of Boston, on Cape Cod, and in Rhode Island. Beaches are especially fun if you know something about their seashells, birds, grasses, seaweeds, crabs, and much more. This Westborough author/biologist provides a knowledgeable and readable guide to our seashore environments. Read it at home or take it with you to the beach. Stokes Field Guide to Birds (Eastern Region) by Donald & Lillian Stokes (Little, Brown, & Company, 1996) (paperback) – a handy, easy-to-use, all-purpose guide illustrated with photos and packed with key information. It’s easy to carry or keep near a window that looks out on a bird feeder. Many larger, more elaborate field guides to birds exist (by these New England authors and others), but this one is great for basic, everyday birding. The Secrets of Wildflowers by Jack Sanders (Globe Pequot Press, 2003) (hardcover) – a wonderfully readable and highly literate book by a New England author/naturalist, with photos, covering more than 100 wildflowers, with a unique focus on their roles in folklore, literature, history, and human use. A truly special book. Wild Urban Plants of the Northeast: A Field Guide by Peter Del Tredici (Cornell University Press, 2010) (paperback) – Don’t be fooled by the title. Many of the plants that we see here in Westborough also grow in urban settings. This book provides useful information and photos in a compact and well organized format and features wild plants – native and non-native – that we’re likely to find in Westborough and elsewhere. The author is a research scientist at the Arnold Arboretum of Harvard University. Ancestral Plants: A Primitive Skills Guide to Important Edible, Medicinal, and Useful Plants of the Northeast, by Arthur Haines (Anaskimin, 2010) (paperback) – a definitive, readable, and thorough reference book about the various uses of common wild plants in New England for food, medicine, dyes, and sources of material for fire-making, fiber, basketry, bows, arrows, and more. The author is a research botanist at the New England Wild Flower Society. Tracks & Signs of Insects and Other Invertebrates: A Guide to North American Species by Charley Eiseman and Noah Charney (Stackpole Books, 2010) (paperback) – The topic may seem esoteric, but the world is filled with insects, and we typically see signs of their existence in the natural world and around our dwellings. These New England naturalists draw readers in with photos and information about the tracks and traces left by insects and other small animals without backbones. Check out these nature books, and others, if you’re shopping for a gift for a nature mom, an outdoor dad, kids who love the out-of-doors, a Boy Scout or Girl Scout, or a grandparent who cares about nature. Or add one of these books to your own wish list.